Motorola Mobility shipped 250,000 Xoom tablets in the first month the device was available, the company said on Thursday as part of its first-quarter earnings report. 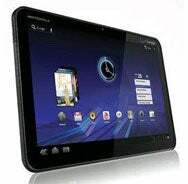 The tablet, the first to run Google’s Android Honeycomb OS, went on sale in late February. Within weeks, several analysts said early sales were disappointing. In early April, one analyst estimated that Motorola had sold a total of 100,000 of the tablets. Shipping a quarter of a million in a month isn’t quite the same as initial iPad shipments, but the number appears to be better than many had expected. For the full year, Motorola is expecting to sell 1.5 million to 2 million tablets, it said. It plans to introduce new tablets, including some with new form factors, this year, executives said during a conference call to discuss first-quarter results. During the quarter, Motorola Mobility also started selling the Atrix, a phone that can be docked into a device with a full keyboard and monitor. Some analysts have also said sales of the Atrix are weak. The company did not pull out Atrix sales numbers. It said it shipped 9.3 million mobile devices, including 4.1 million smartphones, during the quarter. Motorola expects to record an operating profit for the full year, but faces challenges ahead. It has delayed the launch of the Bionic, its first LTE device, and on Thursday said the delay is related to a software problem. That same problem is also pushing back the launch of LTE on the Xoom, which was initially expected for the first half. Both the LTE Xoom and the Bionic are now expected to come in “summer,” which in North America could be as late as September. “There’s a great deal of complexity in launching any new technology like this,” Sanjay Jha, chairman and CEO of Motorola Mobility, explained. Still, the delays put Motorola at a disadvantage compared to its competitors including HTC, which is already selling an LTE smartphone, and LG, which is soon to launch an LTE phone with Verizon. Motorola reported a loss of 27 cents per share on net revenue of $3.0 billion. The loss is better than the 72 cents per share it lost in the first quarter this year. Net revenue was up 22 percent from the first quarter of 2010. Analysts polled by Thomson Financial had given an average forecast of $2.84 billion in revenue. Excluding certain items, Motorola Mobility reported a loss of 8 cents per share, beating the analysts’ forecast of a 12 cent loss per share. The company expected a challenging first quarter, in part due to new competition at Verizon from the iPhone. The Droid franchise at Verizon has been a big driver of sales for Motorola. The company bought 3LM, a mobile device management company, during the quarter. Also, it plans to add new productivity features to its webtop application, which allows the Atrix to pair with a dock, and plans to introduce additional devices that use webtop. Several Fortune 500 companies are running trials with Motorola Android enterprise products and services, Jha said. Motorola Mobility, which separated from its parent company in early January, has two groups: Mobile Devices, which makes phones, and Home, which makes set-top boxes and other IPTV equipment. Spinning off the mobility division was part of the company’s strategy to turn around lagging results.